We maintain a complete inventory of pharmaceuticals, vitamins, shampoos, and parasite prevention and control products to meet the needs of your pet. 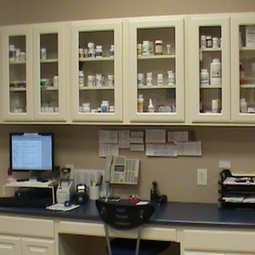 When available and economically viable, human pharmacies are utilized for some needed products. We also utilize compounding pharmacies in order to provide you with the best dosage and formulation options for treating your pet. We know that many people's schedules can make it difficult to make it in during our clinic hours. We now offer an online pharmacy for client convenience.